It's summer time here in Myrtle Beach, which means family vacationers and golfers who would like to sneak in time on the links. Whether you are a single or a foursome, let Golf Zoo pre-book your tee times for you. Play premium golf at off season rates and check out a course your fall or spring group is planning to play. If you are staying in South, Central or North Myrtle Beach, no problem - We Cover It All! So make sure you bring your sticks and we will take care of the rest. So what are you waiting for? Give us a call @ 800-929-7300, Linda and Craig, your golf vacation specialists, will take great care of you! 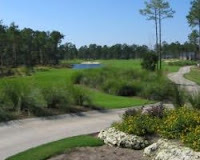 Leopards Chase is the newest course at the now 72 hole facility of Ocean Ridge Plantation. The resort is located in the north end of Myrtle Beach’s Grand Strand just over the border into North Carolina. Tigers Eye has been their top offering which is consistently on the list of top 100 public courses by Golf Digest. Leopards Chase however was designed to take that top spot and further strengthen the quality of the resort. The course was designed by Tim Cate, who designed all four courses at Ocean Ridge. Leopards Chase has everything from a man made waterfall to an island green and beautiful landscaping. 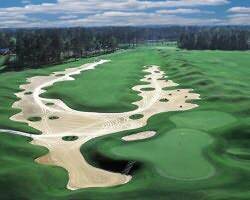 When planning your next trip to the Myrtle Beach area give one of our golf specialists a call and be sure to ask out the new Leopards Chase Golf Course. If you don't mind being a road warrior for a couple of days, have I got a great package for you. Golf Zoo and Ginn Resorts is offering the Ginn Challenge. This package is based on 4 players in a three bedroom villa and 5 rounds of Championship caliber golf. Package rate is $750.00 per person. I will give you some details on the resorts and the golf courses they have on property. The resort at Reunion has just been named a "Distinguished Member of Preferred Hotels and Resorts. Reunion Resort hosted the "Big Break Reunion", seen on The Golf Channel. The facility also host the LPGA Ginn Open. The 3 courses on site are designed by Nicklaus, Palmer and Watson. The Legacy course made Golf Digest's #21 of America's Top 4 new courses, 2005. It also made Golf Weeks #12 Florida's Best Public Golf Course, 2006. The Independence course received the following rewards: Golf Digest #10 America's Best New Resort Course, 2005. Golf Magazine Top 10 best new courses you can play. Golf Week #4 Florida's Best public access, 2006. Cond'e Nast Traveler - "Top 100 Golf Resorts", 2006. Resort and Great Hotel's - "Connoisseur's Choice Award", 2006. AAA Four Diamond Award, 2004 - 2006. The 2 courses on site are designed by Nicklaus and Watson. The Nicklaus Course (Ocean Hammock) host the Senior PGA Tour Ginn Championship. Here are some of the awards the golf courses have received: Golf Week - "America's Best Courses you can play, Rated # 3 in Florida, 2006 and "Top 100 Resort Courses", 2006. Golf Digest - "America's 100 Greatest public courses, 2005. Golf Magazine - "Top 100 you can play", 2006. These are two of the best golf resorts in Florida. The two resorts are located about 1 and 1/2 hours apart. Don't let the travel discourage you - it is well worth the drive.